Hidcote Lavender has long been one of the most sought after Lavandula angustifolia varieties. According to The Genus Lavandula, while this Lavender was named after the estate of Lawrence Johnston, there are no records which verify that this plant actually started out life in his garden known as Hidcote Bartrim. It is more likely that he brought it with him from his estate in France in the 1920's. It is also sometimes referred to as Hidcote Blue or Hidcote Purple. 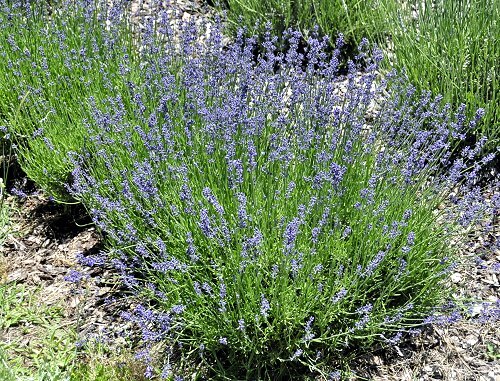 Hidcote Lavender is one of the darkest flowered of the Lavandula angustifolia group. Often Hidcote Lavender plants from other sources are propagated by seed that does not come true to the original plant. It can be very difficult to locate the proper dark purple Hidcote Lavender. Our Hidcote plants are always propagated by cuttings so their characteristics remain true to the original plant. Like all Lavandula angustifolias, Hidcote Lavender grows better where summers are in the 80's rather than the 90's. And in keeping with its group it is also slow growing. This plant is often available in plug trays. These trays hold 128 of all the same plant. They are a great low cost way to fill a lot of space. Each cell is 3/4 of inch by an inch. Check here to see if Hidcote Lavender Plug Trays are available. Hidcote Giant Lavender (a Lavandula x intermedia variety) was also named after Hidcote Bartrim but is a completely different plant which better tolerates hotter summers and gets much larger. Hidcote Lavender makes a great addition to our Zone 5-11 Fragrant Herb Garden Six Pack.